Lima is the county seat of Allen County, Ohio. Lima is located along Interstate 75, between Dayton and Toledo, approximately 72 miles north of Dayton and 78 miles south of Toledo. Lima was founded in 1831. Delphos was originally four little towns: Howard, Section Ten, West Bredeick and East Bredeick. In 1851 the four towns merged into a single town known as Delphos. Beaverdam was established in 1853. The village name was coined due to the abundance of beaver dams near the original town site. The village was incorporated in 1878. Bluffton was originally known as Shannon, is a village split between Allen and Hancock counties. Bluffton is home to Bluffton University, a four-year educational institution affiliated with Mennonite Church. Cairo was originally called West Cairo, and was established in 1848. The name was changed to Cairo in 1922. Main Street in Cairo was a part of the country’s first coast to coast road, the Lincoln Highway. Elida is an Allen County village that was established in 1852 and incorporated in 1878. 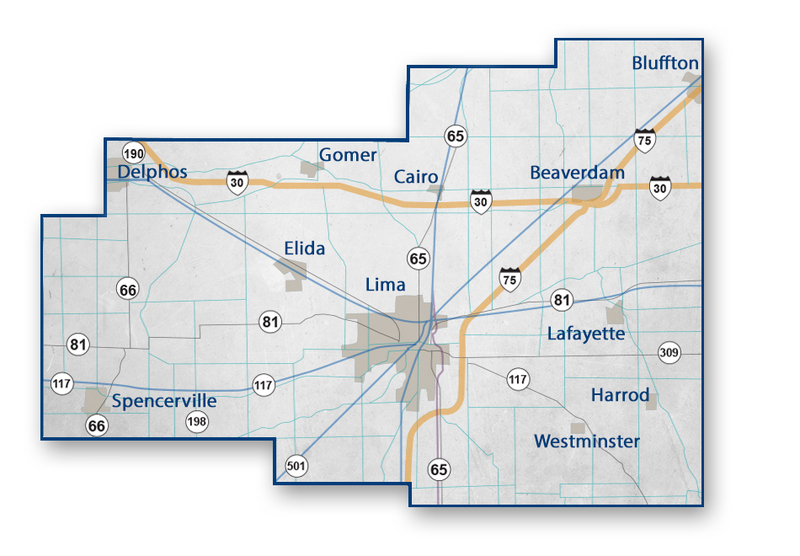 Elida is home to the Elida School district, providing education to students in grades K-12. Harrod is an Allen county village that was named after the local Harrod family who settled in what is now Harrod, Ohio in 1841. The village was established in 1884. Lafayette is a village in Allen County, Ohio and is part of the Lima, Ohio Metropolitan Statistical Area. The village was incorporated in 1868. Spencerville was founded in 1844 on the banks of the Miami-Erie Canal. A small Northwest Ohio community, home to approximately 2,300 residents.